ROUND ROCK, Texas - Peak Events and the Round Rock Express are proud to announce a multi-year partnership to host the Round Rock Classic at Dell Diamond beginning February 21-23, 2020. The Round Rock Classic will take place on the second weekend of the season and will replicate the already established Frisco College Baseball Classic, which takes place in Frisco, Texas on the third weekend. The event will host four Division I teams competing in a round robin format over three days. Each team will play a single game each day for a weekend total of three games. 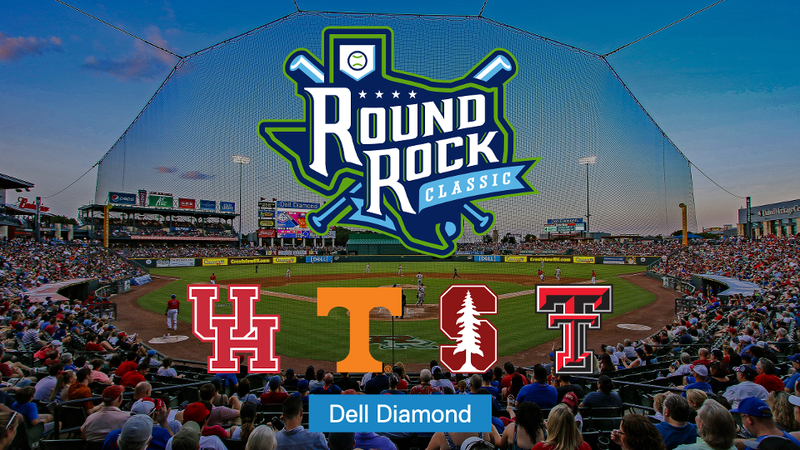 The inaugural Round Rock Classic will feature four of the country's top teams in 2020, including the Houston Cougars, Stanford Cardinal, Tennessee Volunteers and Texas Tech Red Raiders. Like the Frisco Classic, the Round Rock Classic will provide a regional-like atmosphere during the second weekend of the college baseball season. Peak Events strives on providing the top tournament experience outside of the College World Series in Omaha and has committed to the brand of #BestOutsideOfOmaha. "We are excited to bring a College Classic to Round Rock. The Austin area is one of the fastest growing areas in the country and we are thrilled to host some of the nation's top Division I teams in arguably the top Minor League ballpark in the country. The Round Rock Express have proven to be a top-notch organization and a group that we are anxious to work together with in order to grow this into a top destination for teams in search of early season competition." Director of Peak Events Nathan Wooldridge said. "We couldn't be more excited to partner with Peak Events to host the inaugural Round Rock Classic in 2020," Express President Chris Almendarez said. "It's no secret that Central Texas is home to the best baseball fans around, and we can't wait to see Dell Diamond play host to some of the best collegiate teams in the country next season." Tickets For the 2020 Round Rock Classic will go on sale in early June. Follow us on Twitter at @RRockClassic or visit us at www.roundrockclassic.net to stay up to date. Peak Events, LLC is an event management firm out of Frisco, Texas that operates under Peak Sports MGMT. Peak Sports is a sponsorship/advertising and event management firm out of McKinney, Texas. Current properties for Peak include, University of Central Arkansas, Austin Peay State University, Southeastern Louisiana University, West Texas A&M University, Southern Illinois University Edwardsville, Pittsburg State University, Murray State University, Nicholls State University and Northwestern State University, in addition to the Frisco College Baseball Classic and the Round Rock Classic. Find more info at www.peaksportsmgmt.com or www.peak.events. The Round Rock Express Baseball Club is entering its 20th season as the proud Triple-A affiliate of the Houston Astros. The franchise was founded by Ryan Sanders Baseball - an ownership group spearheaded by Reid Ryan, son of Baseball Hall of Famer Nolan Ryan, and is now led by CEO Reese Ryan. The Express began as the Double-A affiliate of the Houston Astros in 2000 and moved to the Triple-A Pacific Coast League in 2005, remaining an Astros affiliate through the 2010 season. The club was a Texas Rangers affiliate from 2011-2018. Round Rock has established numerous attendance records at Dell Diamond and has remained in the top five in total attendance in all of Minor League Baseball 18 of the past 19 seasons, winning the PCL attendance crown in both 2016 and 2018. The Express won the 2011 PCL American Southern Division title and the 2015 American Conference championship. A state-of-the-art facility, Dell Diamond has been the home of the Round Rock Express since its inception in 2000. The stadium serves as a premier Central Texas destination and is constantly ranked among the top in Minor League Baseball. Dell Diamond is a true multi-purpose sports and entertainment complex, hosting Express games, rugby and soccer matches, concerts, expos, festivals and many other events. Dell Diamond truly is a "home-grown" project, with 80 percent of the materials used for the construction purchased from suppliers within the state of Texas.